I try not to write too much personal stuff on this blog, as I can’t think of more than about three people in the world who actually want to know what I’m doing. Even so, this is going to be one of those posts, albeit a short one. We’re so hectic at the moment that I haven’t had time to update this blog as much as I’d like, so instead I thought I’d explain what I’m up to. Basically, it’s an “excuse blog post“. We took on a lot of consultancy work last year, especially from August onwards. We got to work with some lovely people and on some excellent projects, but working seven days a week just didn’t leave any time to build our own things. We decided that we would really cut-back on consultancy work after December, and so far we’ve been fairly good at not taking on too much work this year. At the end of December, I created a couple of 2-day projects (Stereotype, Fan Ranked) to try to get back into the swing of iterative, agile development. Actually, Fan Ranked was relatively successful, given the small investment: it was making about $20 per week in affiliate fees. Unfortunately, it was a little too late. A few weeks after launch, the Google ‘content farm’ update obliterated it from the search rankings (as it should, I suppose), and it now just sits there, gathering about five meagre visits a day. Still, these projects got my development-fu back in motion. Over the next month, I started to build up a bigger app: Rosella Twitter Games. I made good progress, but soon decided that I should probably finish other commitments before embarking on larger projects. With that in mind, the last month I’ve had my head down with writing Designing Web App Success. I’m about 18 chapters into the 25, and making good progress. I’m REALLY excited about the book – it’s crammed full of good stuff, from business models to personas, typography to testing, development to SEO. 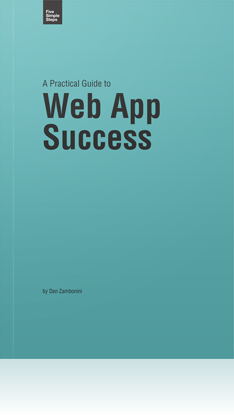 I really want it to be The Definitive Manual for web apps. I’m a little fed-up with those books that are 20 chapters of the same thing, full of fluff and inspiration, but no real actionable information. This book is going to be the opposite: about 20 books condensed down into a single ‘need to know’ compendium. We’re also about to ‘pivot’ the Contentini agency model / website, but I don’t want to say too much about that quite yet. We’ve built some apps under the Contentini brand over the last couple of weeks (e.g. Web Strategy Twitter Trends), so that might give you an idea. Until next time, whenever it might be.